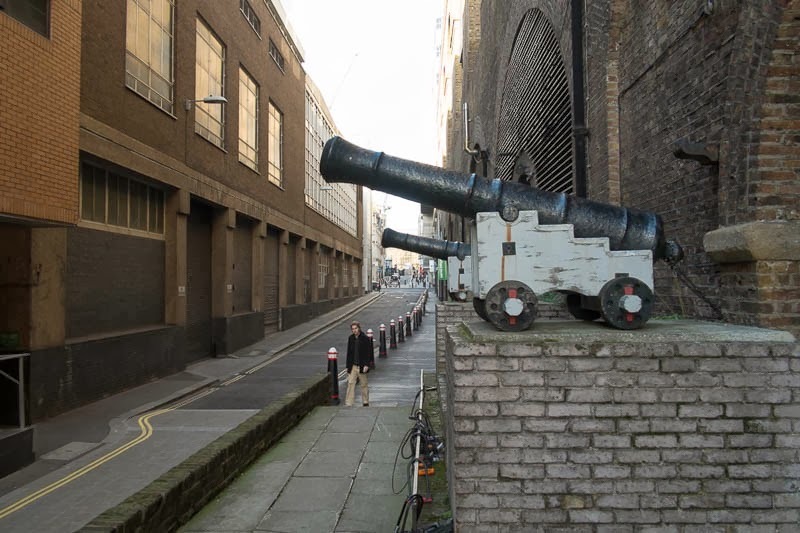 A couple of canons in Cousin Lane caught my eye the other day. Have they always been there or are they a recent addition? And what do they signify? The lane leads up from the Thames to Canon St Station, maybe that is why they are there. Back when the banks of the Thames were all dockyards there was a steelyard here. During the second world war the area was severely bombed. During the great fire (1666) this spot with its combustible goods such as brandy and spirits, coal and tar, ropes and cloth contributed the spread of the fire. None of this answers my question, what is the reason for the canons? Anyone know? Was it an old Naval base round there? They have been there as far as I can remember (at least as far back as 2001). The Gym behind the doors is owned by the 'Cannons Group,' who now call themselves the 'Nufield Health,' from what I can make out. Canon St station above it. It's a good position for them to be in, anyway. It looks like the cannons are aimed at the building across the way. Not good neighbors, I would say.